The criminalization of youth continues, same as it ever did. 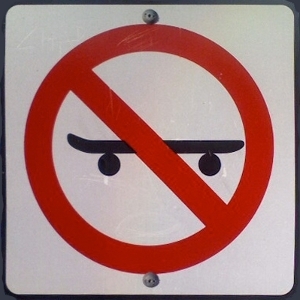 Relying on the same tired excuses of protecting public property from use by under-aged citizens and protecting kids from the risks of physical activity, the Manhattan Beach city council banned jumping “on or over objects” on a skateboard. Violating the ban, which is inclusive of both public and private property, carries a penalty of up to 1 year in jail and a fine of up to $2000. “The police made it a high priority to be out there and to talk to the skateboarders and say, ‘No skateboarding is allowed here,'” said Lombos. With Burglary down 6.2%, robbery down 26%, DUIs down 43% and arrests down 31%, it only makes sense to write new laws for Manhattan Beach officers to enforce. And if you’re going to criminalize the activities of class of citizens, it’s best that they not be able to vote.